In 2011, 44.6% of all U.S. deaths occurred under the care of hospice. That number has a huge impact on the ability of funeral homes and cremation businesses to win calls. About 90% of low-cost cremation families choose a “provider” that hospice speaks well of, or unofficially recommends. That is why it’s critical to find favor with hospice and win those referrals? In today’s program we are going to show you how to do that. Like or share this video with your friends and colleagues. 01:05 Percentage of deaths in the United States were under hospice care. 21:59 How giving out awards/recognition for Caregivers and Hospice workers beneficial to cremation arrangement websites. Robin Heppell: [00:00] On today’s show, we will be talking about how to win more referrals from hospice. Hospice referrals have a close rate of around 90 percent for low cost cremation referrals. With 50 percent of all US deaths happening under hospice care, you can’t ignore this lead source. If your competitor locks up the favor of hospice in your market, you’ll get locked out of this big opportunity. 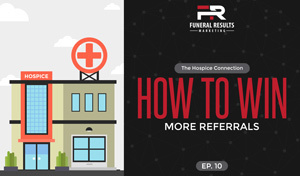 [00:25] Stay tuned as we share how to connect with hospice and win more referrals. [00:31] Welcome to strategy talks by Funeral Results Marketing, where funeral professionals discover the latest marketing strategies that get results. Now join Robin Heppell and Brian Young as they share their insights and experiences to help you and your firm during these ever changing times in the funeral profession. Robin: [00:48] Welcome to another episode of strategy talks by Funeral Results Marketing. Today, we’re going to be asking Brian some questions about how to find favor with hospice. To get started, Brian, why should we be concerned about hospice if we are in the death care business? Brian Young: [01:05] That’s really the question of the day, Rob, and when you look at the numbers, it makes it all clear. In 2011, 44.6 percent of all deaths in the United States were under hospice care. So that equals 1.16 million calls if anybody is doing the math. On top of that, it’s important to understand just how fast those calls happen sometimes. [01:29] While it’s true that the average hospice stay is about 72 days, the medium hospice stay is just 19 days. Hospice has time to build relationships with these families and actually, as we’ll talk about a little bit later, 36 percent of people on hospice die within the first six days of being on hospice care. [01:50] Hospice can be right there in a lot of cases where there’s a short amount of time, and that’s going to influence the families a lot if they’re asking hospice what they should do. Robin: [02:00] Obviously, hospice can play a huge role in winning calls each year, but how do you get them to recommend or share your name with families? Brian: [02:08] That also is a good question. Obviously, we’ve got to understand hospice if we’re going to be able to become friends with them, if we’re going to find favor with them. I like to try to understand people and what their needs are, and what are they going through. I thought I’d just use a first person example. [03:24] As you can see there from that excerpt written by a hospice worker, these people are hard workers. They usually have a lot on their plate. In fact, quite often, they have more on their plate than they should because they don’t get paid a lot. Those organizations oftentimes don’t have a lot, though I think that’s changing in some cases. [03:43] If we’re going to understand hospice, we have to understand that they’re overworked and short on time. We have to understand that they’re paid little, relatively speaking, and they work a lot of donated hours. We have to understand that they’re doing it to fulfill a calling. There’s something inside them that’s satisfied by the sacrifice, this work that they’re doing, or else why would they do it? [04:03] Also, the currency or the commodity for hospice in many cases is that they expect to be respected. They want to be appreciated for what they’re doing with their lives. Like I mentioned a minute ago, 36 percent of patients died or are discharged within less than seven days, actually six days of being on hospice. [04:22] Something else to understand is that hospice is moving fast. Their first goal when they hold all of a family is to finalize arrangements. Their second goal, believe it or not, according to surveys, show it is to protect the families. [04:36] If we’re going to understand hospice, we have to understand what they’re going through. Now, also something else I should bring up is that often, the hospice worker is adopted by the family. Here’s what I mean by that. [04:55] 67 percent of hospice patients are cared for in their home. 41 percent or 42 percent, I can’t remember exactly, it’s in a private residence. This equals a close relationship that can develop over time, especially for those patients that that do live longer than five or six days. Even if they only have five, six, seven days to live, or two or three or four, that’s an intense period. [05:18] There’s a lot of emotion and that hospice worker gets invited in. They’re often sitting down at the table. Quite often, they’re served a meal or snacks that they have time to have them and they’re building a relationship with these families. [05:31] They’re taking care of that loved one and that’s why it’s like being adopted. Once they’ve been accepted by the family, they’ve got a bond there that is really hard for any funeral home or funeral director to ever get close to. [05:46] That’s what I talked about or what I mean when I say we’ve got to understand hospice and what they go through if we’re going to have the right kind of emotional foundation, that right understanding to start building a relationship with them and try to become friends. Robin: [06:05] Yeah, for sure. That makes sense and it gives a better understanding of all the pressure that they’re dealing with. How do we take that information and help? As a funeral home or cremation provider, how do we stand out with them? Brian: [06:22] Let’s go back and dissect a little bit what’s happening in that house with the hospice worker and the family. Some of the most common questions that a hospice worker gets asked is who should we use and what will it cost? [06:55] Hospice recommends providers, but they have to follow certain rules. At least, officially they do. Typically, they’re required to recommend or to cite three businesses, not just one. That’s what they’re supposed to do, but if you want to know how you can stand out to a hospice, now you can get on that list of three or oftentimes, a list of one or two. I’ll talk about that more in a second. [07:20] Here’s the things that I’ve heard and some of these from interviews I’ve listened, people I’ve talked to, there’s a presentation that’s been in a couple of conferences lately I think touches on this one. [07:31] Hospice workers are there taking care of the family. They see that family under a lot of stress and they don’t want to see that family have to go under any more stress or any more suffering than they’re already going through. [07:44] One thing that’s important to them is that the removal will always be done on time and/or possibly any other interaction with the family, but that it is always done on time. Another thing that really influences hospice workers’ opinion of a business is how the removal was conducted. [08:01] In fact, I’ve heard a lot of funeral homeowners and cremation business owners say, “Yeah, that’s really the ticket. That’s the only time that we’re interacting with hospice.” I’ve heard one hospice worker say the same thing, so how that removal conducted is really key. [08:16] Quite often, the hospice worker is there when the person has died and if they’re still there when the removal team comes, they’re watching it like a hawk. If it’s done in a kind of professional way, it’s very considerate of the family’s emotional state. That’s a big deal. [08:35] On top of that, I’ve heard a number of hospice workers say in the interviews that what really wins them over is if the removal team is flexible. Let’s say, the removal team arrives. The person or the couple that have come to get the deceased and some of the family is like, “Oh, can we have a few more minutes?” Or I heard one example. This was in a presentation I heard recently, but I’ll pass it on. [09:03] There was an estranged brother, let’s say of 20 years and he suddenly decides he has to reconcile or something like that and can that removal team to stand and wait? Now, that is a tougher decision when you’re talking about a low cost business because obviously, there’s not a lot of margin. [09:21] But, if you look at these, what could be obstacles or inconveniences as golden opportunities, that can be a real fortunate opportunity for you because if you’re like, “Sure, we can wait. That’s no problem. Yeah. We’ll just be outside or whatever works best in that situation,” that goes a long distance with hospice. [09:43] The goal here, of course, is to stand out for being better than everybody else and when they’re only interacting with you for relatively a few minutes, that can be hard to do. Your removal experience is probably the single biggest way to stand out the hospice within the context of somebody having died and doing your job. [10:03] There’s a very critical way I’ll talk about in a few minutes, but it’s outside of that context. Within the context of doing your job in the realm of funeral care and death having occurred, of course, the removal is the biggest opportunity. [10:20] I’d mentioned that the two most common questions that are asked are who should we use and what will it cost? Let’s talk a little bit about the what will it cost question. Hospice wants to pass along details that are useful and practical without getting into minutiae. They’re not funeral directors. However, they’ve become pretty aware of who’s in their town. [10:57] I’ve heard hospice workers who carry a bunch of different sheets or things in their bag and they can just hand them to families and let them see those. They’re looking for a simple explanation that they can pass on. They’re looking for a simple explanation of cost and service. [11:15] This is a place where you can find some opportunity for advantage. If you create a brochure that has a cost and service comparison info chart, it’s a great opportunity to show if you do it in an unbiased and straightforward way here’s business one, business two, business three, our business, here’s what’s included for a direct cremation cost price. [11:41] Especially if you’re the one who comes out the best in that chart, which is the way you’d want to structure it, then that’s a good thing for you. It’s helpful to the hospice worker because if it’s up to date and of course, you want to have on there a little citation that says this information was gathered on such and such date. [12:01] That can be very helpful for the hospice worker because it helps them give something practical to the family. That being said, as you probably know, but if you don’t, hospice is not supposed to pass on anything that would seem to give an advantage or seem to be a recommendation. At least, they’re not officially supposed to do that. [12:21] One of my favorite stories to share was there’s a lady who was a marketing officer for a lot of years at the Cremation Society of the Carolinas. She had great success with getting referrals from hospice. They were told they couldn’t have any of their branding on the pamphlet or the trifold or the bifold. [12:43] But, if they had a generic bifold or trifold and they put useful information in there like pricing, maybe if there was any special city codes or ordinances regarding scattering, the other practical, helpful, very timely, useful information that hospice workers wouldn’t know so much about, and put that in a pamphlet or trifold or bifold. [13:06] That they would allow the cremation business or funeral home to have a sticker manually placed at the bottom of that that had their contact information. Say, provided by ABC Funeral Home and their phone number and their Web address. [13:25] I’ve heard of several firms over the years that have used that strategy and they’re able to pass on those type of things to the hospice workers. It gets you noticed because it’s practical, it’s useful, and it’s helpful to the hospice worker and to the family. Robin: [13:44] Brian, what do you recommend for the funeral homes and cremation providers to do to…What else can you do to get hospice to notice you because there’s a lot of forward thinking funeral directors who are already doing a lot of these things. What do you recommend? [14:24] I had one hospice worker I was listening to and she explained a lot of times, they’re meeting with the manager. They’re not actually getting to meet with the caseworkers, those frontline hospice nurses that are out there taking care of the families and the person who’s dying. [14:43] Building relationships with those hospice workers, with the nurses from the frontlines, obviously that’s the key. Those are the people making recommendations. What do I mean by that before I go a tad further because we’re talking about how to connect with hospice. Yes, the rules say that Hospice is not supposed to recommend one. [15:41] The reality is, there’s no law enforcement who’s there to stop that and you and I both know that it comes down to that hospice worker, in the moment, there’s nobody around. There’s a very good chance they can make a recommendation or refer somebody away from a business they’re not happy with. You really want to get those hospice workers on your side. [16:03] Getting back now to how can we get hospice to notice you, how can we get them to like you more. Well, they’re very careful not to trade referrals for something like a favor, so we don’t want to be offering them favors, but a couple things that I’ll highlight here. “[17:16] You’re doing us a favor.” Of course, the back side of that is when you do a favor for somebody that really matters to them, there’s just that tendency to want to recommend you because you were nice to them, you really helped them out. [17:29] Finding gaps and understanding and providing helpful answers in a clear, concise manner that’s easy for them to reference, that can be good. I know of a guy who created a section on his website for hospice that just had a common Q&A by hospice and he had answers on it. [17:45] That’s something that shouldn’t cost you anything or even if your website company charges you to put up a page, it’s still just a small fee. Usually, it won’t cost you anything and that can be very helpful. [17:58] Another thing that I heard and this is actually my favorite, most people I’ve talked to have not heard of this before. Hospice has done a fantastic job of building relationships in the community. One of the things that hospice has done is they do a lot of charity work, they do fundraisers, and they’re putting in extra hours to benefit their community. [18:25] If you want to get noticed, rather than just bringing around donuts or bagels, see how you can get involved in their projects. How can you help these non profit hospices to help their communities? [18:38] In a lot of cases, hospice might need a space to meet. Sometimes they just need a meeting space because they’re going to do some kind of informational meeting, a free meeting for the public, and they need a space. [18:51] If nobody is using your chapel, or one of your reception rooms, or something like that, that might be something you can offer. Some firms even have a reception area, so if you can offer your reception area at no cost who knows, maybe even offer the coffee that can go a long way because you’re giving practical meaningful help to them. [19:11] Another thing is if they’re having these fundraisers, if they’re doing any kind of a fundraiser, you can say, “Hey, can we show up and help out?” It could be anything from a garage sale to a cleaning the park. [19:26] There’s a number of different things that a hospice organization might try to do, whether it’s for public relations, just general bringing awareness, or if it’s a targeted specific objective of that hospice organization. [19:38] If you ask if you can come and help out, and you’re working side by side, rubbing elbows with these people and helping them in their cause, working like a neighbor in the community, how can that not make friends? It’s going to do something good. [19:54] Now they know you by name. Now they’ve spent an hour and a half with you, two hours, three hours on a Sunday doing something that really helped the community, and they know you. As one of the hospice workers I heard interviewed in Virginia said, “You think that’s not gonna come out when we’re talking to families?” Yeah, I think it probably is going to come out. [20:15] I have heard of more creative things, probably the most famous one that I’ve heard is a funeral director who likes to take several hospice workers on a trip. A couple times a year, he takes them to some nice tropical location, and they have some kind of educational activity for a few hours a day, and then they get some free time each day. [20:36] They go out for a long weekend, or something like that, I don’t want to give away too many details. Some funeral home owners have complained, hey, that’s like buying a boat, buying a referral. I’m not sharing it here as a recommendation. [20:50] I’m actually sharing it to give context and show how some funeral home and cremation business owners have realized just how valuable hospice workers are, in terms of numbers and how many cremations they can win as a result of a hospice worker who’s referring them. They’re literally willing to invest that kind of money to carry favor with the hospice workers. [21:14] Again, you go back to what I said at the beginning when we do the math, the average hospice worker is carrying far more than 10 or 12. Even if they’re just carrying 10 cases and 36 percent of those cases die, or discharge in less than seven days, do the math, that’s adding up to a lot of referrals. [21:37] A hospice worker can easily be working with 50 families in a year and quite often, far, far higher, I’m trying to be conservative. When it comes to getting hospice to notice you, there is a lot we can do, but we just need to be practical about it and useful about it. Robin: [21:59] Brian, one of the other things that I’ve heard is having the caregiver award, or the hospice caregiver award that’s awarded on a monthly or quarterly basis. One of our cremation arrangement clients has set up special coupons codes for each hospice in his area. [22:25] Not only can he track where the referral came from, but they feel obligated to pass on that they can get a certain discount if they use this firm. There’s a lot of other things that can be done with, again, trying not to overstep the bounds, but providing value as well. Brian: [22:51] I’m glad you brought that up because that example of the awards or the recognition, as we already talked about, they’re not doing it for the money. Nobody does hospice care to become wealthy, so yeah, that’s recognition, that really is the fuel of a hospice worker. They want to recognized, they want to feel important, it’s a great example. [23:11] One thing I wanted to share real quick before closing here is that when it comes to one of the new realities of death care, or the funeral industry, it’s recently this growth of cremation arrangement websites. We talk about those and other podcasts and in other materials we produce. [23:33] I’ve been surprised over the last eight years I’ve been paying attention to this particular set, about eight years ago how much hospice workers get behind websites that allow the family to arrange a cremation by themselves, particularly for the cases where the family doesn’t have a lot of money. [24:12] That’s the part that seems to really appeal to the hospice worker is that you’re in total control. I just wanted to throw that out there that that’s a piece of the pie as well, and if you have a cremation website as part of your business mix, don’t forget to be sharing that with hospice workers. [24:30] Send them an email with the link where they can test drive it. Put it in a card and just mail it to them, not for families necessarily, but just keep planting that seed. Because there’s a lot of cases where a hospice worker might decide that’s the family’s best interest, and if you’re the one who has it and they know it, that can be a win win for you. Brian: [25:10] That’s a great idea. Robin: [25:12] Lots of ways just to nudge and hint a little bit. Robin: [25:17] That’s great, Brian. You gave folks lots to think about, even just to start thinking what they could do. You don’t need to implement all five or six things that Brian spoke of. But one thing that we’d want to leave with you today is just a little bit of a challenge. [25:39] Today’s challenge is to write down the names of all the hospice workers that you know I’m not saying just the organizations that you stop in and visit, but the caseworkers that you’ve met and have gotten a good vibe from and make a goal to add one of those per month. [25:57] Because as Brian pointed out, these caseworkers have 10 or more patients at any given time and a third of them are probably going to die within a week or so, or less. This is just too big of a lead source to overlook. [26:14] Brian, do you want to just take a few minutes to share what’s happening at Funeral Results Marketing? Brian: [26:20] Sure, Rob. The most exciting thing we’ve got on the horizon right now at least looking down about three months from now is the upcoming CremationConference.com. For 2017, we’re having it in St. Petersburg, Florida. If you haven’t seen our emails about that yet, they’re seeing that advertised. Please check it out. Just go to CremationConference.com. [26:42] Our goal there is to provide you an intensive, in depth, detailed, high volume of information regarding all things cremation. Really it’s a cremation marketing conference, but we’re delving into both sides of the coin. How do you launch and grow a low cost, cremation business? How do you increase the appeal of what you can do for cremation families in your funeral home? [27:08] I know you’re going to be talking, Rob, about actually a number of topics how to compete in the largest advertising spaces on Earth, and that’s really what they’ve become. I know you’ll be talking about some technology tools that really streamline the conducting of the business, and increase operations, and reduce cost. We’re going to be listening to John McQueen. [27:32] In particular, I’m excited about that because as some of you may know, Florida went through their revolution, the explosion of the cremation rates decades ago now. John’s going to talk how his family firm survived and thrived as the cremation rate rocketed up from around 20 percent to topping over 70 percent, at least at their location, and how their funeral home thrived. [28:00] Actually they increased the revenue per call there, as well as they launched a low cost, cremation business and a high cost, cremation business, and since that time, they’ve innovated in some other ways. There’s a real case study of what has worked and what it’s like to go through a rapid change where cremation is overtaking burial. [28:21] So that and a whole lot more, but you certainly don’t want to miss out on that, and we hope to see you all there. [28:28] What’s your burning question about online marketing for your funeral home? If you leave it here, we will try to answer on an upcoming episode. If you like what you’re hearing, as always, we do ask you to please leave a comment on the blog, or give it a rating on iTunes or Google Play. Robin: [28:44] I’d like to say thank you too for spending your time with us today. It’s our goal for you to serve more families and provide them with more meaningful services. Make sure you check back soon for another episode of Strategy Talks by Funeral Results Marketing. Until the next episode, this has been Brian Young and Robin Heppell. [29:05] This has been another episode of Strategy Talks with Robin Heppell and Brian Young. To ask a question or leave a comment, visit funeralresultsmarketing.com/talks. To make sure that you never miss an episode you could subscribe to this podcast for free on iTunes, Google Play, and Stitcher. Copyright © 2019 Funeral Results Marketing. All Rights Reserved.